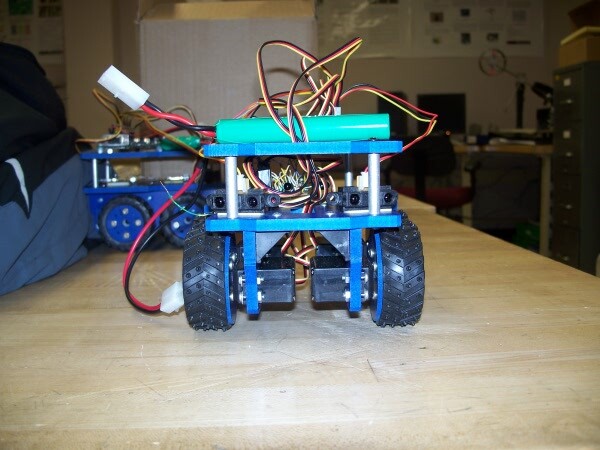 As part of a Robotics class I took as a professional elective, I designed and built two robots with the intent of having them interact with each other. My original idea was to have them play a hide and seek type game, where one robot would chase the other, while both of them would avoid hitting objects in the room. This idea was overly ambitious considering the amount of time I had to complete the project, so during the construction, I modified the design goals of the robots. 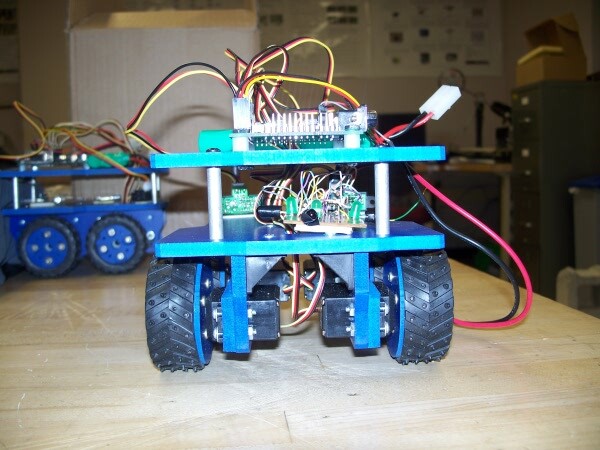 In the end, I built two robots named Oedipus and Tiresias both based on a small 4 wheel drive platform used in one of the basic labs done in class. I fitted both robots with 2 proximity sensors to allow them to wander the room without bumping into objects. 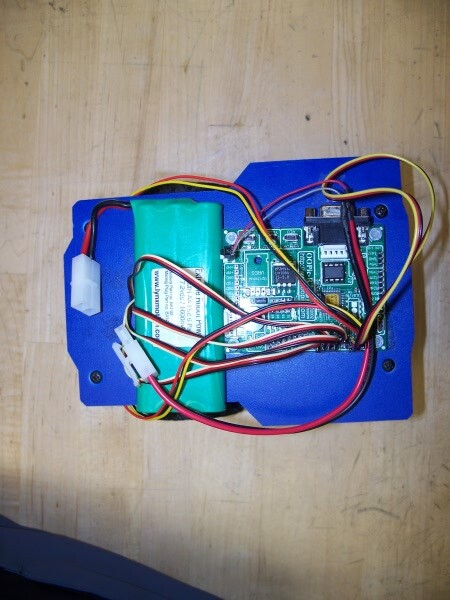 Tiresias, in addition to the proximity sensors, was fitted with 4 IR LEDs. These LEDs would be a beacon for Oedipus to see with a detection circuit, and thus take action. Oedipus was programmed to turn away from the direction that Tiresias was detected. If the other robot is not detected, Oedipus will wander the room in the same manner that Tiresias does. 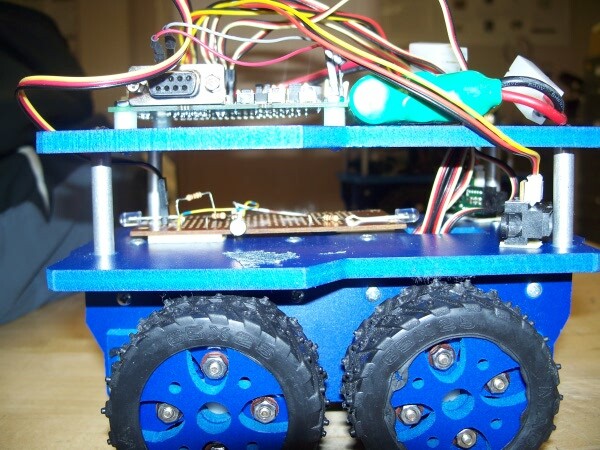 The core of the robots is a OOPic controller, the OOPic-R board with the B.2.2+ controller worked well for this project. Its certainly not the fastest or most powerful board or processor, but provided the basic functionality I needed. This board has 4 ADC ports and 16 digital I/O ports and provides a regulated 5V supply to sensors or any other peripherals. The compiler for the chip uses its own custom syntax for many things, but also allows BASIC and C syntax for the code. The custom commands make setting up some sensors quite easy. 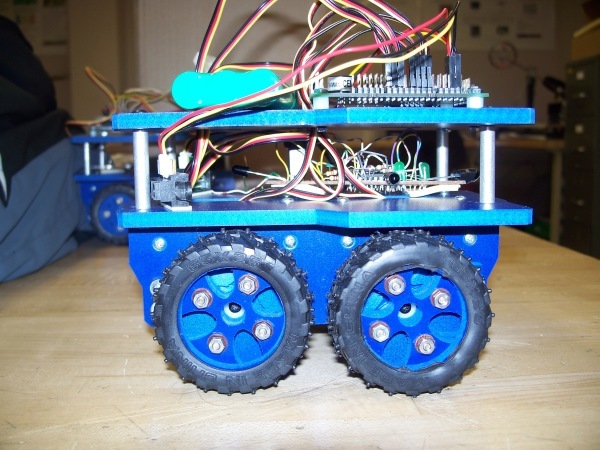 On these robots, each wheel has its own servo, and the servo commands that are part of this compiler made it relatively easy to control them. The obstacle avoidance used in each robot is quite simple. 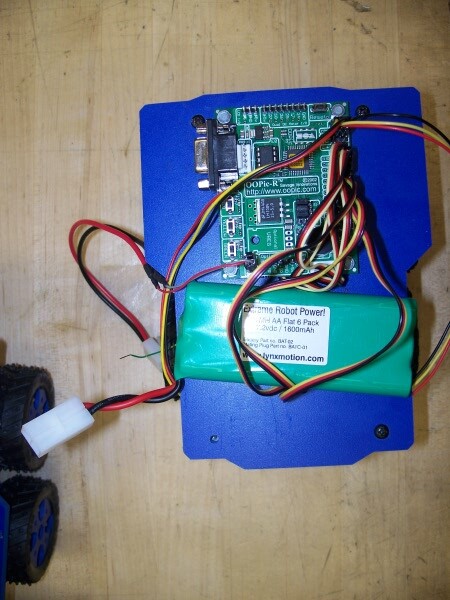 Each robot has two Sharp GP2D12 infrared rangefinders mounted on the lower platform on the front of each robot. They are angled out from the center of the robot by about 30 degrees so that an object that would clip the side of the robot will be detected. 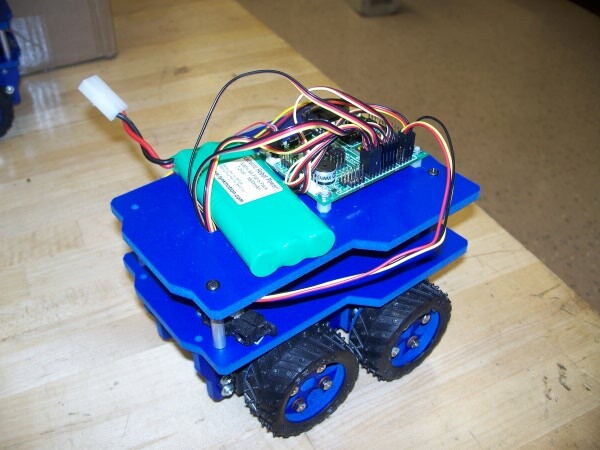 When an object is detected within the range specified by the code (in this case, about 40cm) the robot will turn away from the object until there is no longer an obstruction. The proximity sensors themselves are analog and will output a voltage that is very nearly linear to the real distance of the object detected. The sensors are connected to the first two ADC ports on the OOPic board. In the code, the voltage read by the ADC is compared to a predetermined value that I found through testing the sensors. These sensors were very easy to use and seemed to be quite reliable in the testing that I did on my robots. They did not fail to detect an object even under bright fluorescent lighting, but I’m sure one could find a situation where they may not be ideal. The only time I could cause the sensors to fail was to put something about 5cm in front of the sensor in which case they would fail to see it, but due to the rather slow movement of the robot, it is very unlikely that something could get that close before the robot could react. Perhaps the most important part of the robot was the infrared detection of the other robot. The circuit to do so is rather simple and consists of just a comparator connected to the photo transistor, a voltage divider, and an output LED to provide visual confirmation that it is working. 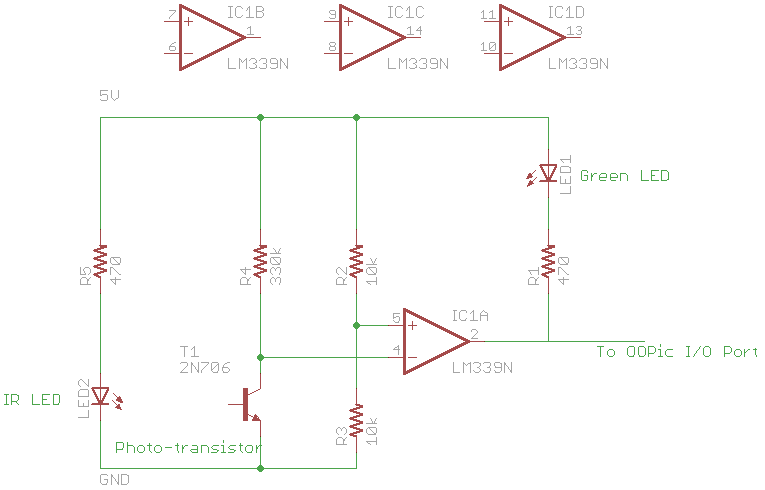 The IR LED is shown on the schematic for reference. To demonstrate the capabilities of the robots, I took two short videos of them in the lab. The LM339 comparator chip used is a quad package. I used three of the comparators to allow Oedipus to sense from the left, right, and behind. I could not get the fourth to work and I was not able to determine why. Tiresias had 4 of the IR LEDs in it with the 470 ohm current limiting resistors on each LED. I could have run all four of the LEDs in series and used a single resistor, but I did not think of that until after I started building the board. The only issues I had in getting the robots to work properly, besides my own inability to build a perfboard right the first time, is that the phototransistors could detect the IR LEDs from behind and on the side as well as in front of them where I wanted. This meant that when the IR LED was supposed to trigger the right detector, the left would also trigger due to IR light going into the bottom of the left phototransistor. To solve this, I put a small piece of electrical tape to cover the side and bottom of the phototransistors which solved the issue. The robots work to my expectations, but there is certainly more that could be done with them. First of all, only one robot is able to detect the other. One robot wanders around the room without any knowledge that there is another robot involved. I would like to put detectors on both robots, and have one actively chase the other. In its current state, on robot runs away from the other, but no attempt is made to make chase. Since this project has already been completed for a grade, I doubt I will continue working on it. Below is a zip file with the code used for the OOPic controller and an EAGLE schematic of the controller board. robotics_project.zip These files are released under GPL version 3 as specified in the COPYING file contained within. Here are some images of the robots.